The United States Green Building Council (USGBC) stopped allowing LEED users to register projects under the LEED 2009 rating system on October 31, 2016. Now, LEED registrations will only be accepted under LEED v4. The USGBC launched LEED v4 in November 2013 as a voluntary rating system and originally had June 2015 as the date when registering under LEED v4 became mandatory but delayed the deadline as many participants were having difficulty grasping and implanting the changes. Please note that the last day projects can submit for LEED 2009 certification (as opposed to registering) is June 30, 2021 meaning any previously registered projects under LEED 2009 must be submitted for certification before that date. The changes in LEED v4 are substantial and if any project party is interested in constructing a green building or seeks LEED certification, relying solely on knowledge learnt implementing a LEED 2009 would be a mistake. LEED v4 cannot be learnt “on the fly” – a thorough review of the LEED v4 is required to ensure all designs and other project specifications are compliant and pre-project consultation with LEED experts (including attorneys) is highly recommended for all project participants. The LEED 2009 scoring criteria was divided into seven categories: Sustainable Sites, Water Efficiency, Energy & Atmosphere, Material & Resources, Indoor Environmental Quality, Innovation, and Regional Priority. Although there were 110 possible points, each project is graded on a 100-point rating scale; and the minimum amount required for certification was 40. Within the seven categories, there were eight required specifications. The Energy & Atmosphere category contained the most possible points (35), and includes three of the eight required specifications. The highest point allocation within this category was the optimization of energy performance (19), which measured energy efficiency of a building. Let me be clear, unlike LEED 2009, which was an update from its predecessor, LEED v4 is a complete evolution in numerous aspects. The key themes that separate LEED v4 from its predecessor are the integrative process, life-cycle assessment (LCA), material sourcing and transparency, and envelope commissioning. Not only does LEED v4 update structurally, but it also substantively changes the prerequisites and the credits. An important change with LEED v4 is the rating expansion. LEED 2009 certification was divided into three sections: Building Design and Construction, Interior Design and Construction, and Operations and Maintenance. LEED v4 expands each category to encompass additional buildings that were not initially included. For example, under LEED 2009, the Building Design and Construction category included new major construction and renovation, core and shell development, schools, retail buildings, and healthcare facilities. 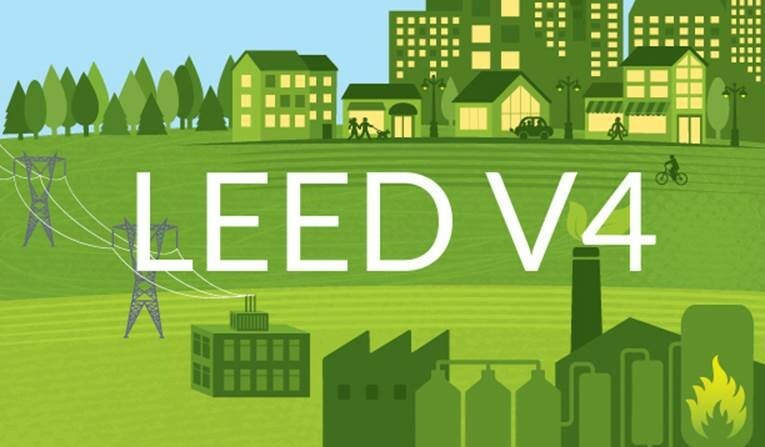 LEED v4, however, adds additional building types to this category such as data centers, warehouse and distribution centers, multifamily mid-rises, hospitality centers, homes, and multifamily low-rises. As such, project participants are required to know many more nuances associated with different types of buildings than what was required under LEED 2009. For example, the LEED 2009 version of the Interior Design and Construction category only contained commercial interiors and retail facilities but LEED v4 now includes hospitality centers under this category. Also, the Operations and Maintenance category of LEED 2009 only included existing buildings, retail facilities, and schools; whereas LEED v4 encompasses data centers, warehouse and distribution centers, and hospitality facilities within this category. Another substantive change of LEED v4 is the new Location & Transportation category. Although this new category, worth 16 points, is carved from the Sustainable Sites category of LEED 2009, the point breakdown and allocation analysis for each element were not simply transferred from the previous model. For example, LEED v4 updated the Development Density and Community Connectivity element of LEED 2009. Under LEED v4, projects earn points in the density and the diverse uses options separately as opposed to jointly; moreover, the element now has warehouse and distribution center requirements to encourage development near commercial, industrial, or transportation sites. Although LEED v4 contains structural changes from the previous version, the credit composition is also significantly different. In contrast to the eight required credits from LEED 2009, LEED v4 has twelve required credits — the newest four are (1) building-level water metering, (2) building-level energy metering, (3) construction and demolition waste management planning, and (4) a separation of LEED 2009’s requirement of water use reduction into two separate prerequisites (outdoor and indoor water use). Moreover, LEED v4 outlines entirely new credits from LEED 2009. To name the most significant, some new credits are the (1) Integrative Process Credit which persuades architects away from the Design-Bid-Build process, (2) Neighborhood Development Location Credit which encourages the selection of a LEED neighborhood-developed certified site, (3) Site Assessment Credit to encourage an earlier analysis of site conditions, (4) Advanced Energy Metering Credit which requires metering of any use that consumes more than 10% of total energy, and (5) multiple credits regarding building product disclosures and optimization. Not only does LEED v4 add entirely new credits from LEED 2009, it also amends existing credits. Credit amendments have an enormous impact on projects for developers, architects, and contractors. For example, many projects in the past would tactfully choose credits that were more cost efficient, low maintenance, and relatively stress-free to achieve certification. Many projects achieved certification under this strategy, but these buildings neglected credits that may have a stronger, more positive impact on the environment. With the implementation of more perquisites as well as the removal of easily attainable (yet less impactful) credits, projects must pay closer attention to the credit allocation of LEED v4. Basically, the days of achieving credits (and possible certification) for installing easily added bells and whistles may be over. Another extremely important change of LEED v4 encompasses the commissioning procedure. The idea behind this is to encourage and somewhat mandate projects make decisions that actually make buildings more environmentally friendly and more efficient. Although LEED 2009 incorporated commissioning to ensure project specifications remain compliant, LEED v4 demands much more oversight. First, LEED v4 requires more equipment to be commissioned. LEED 2009 only required commissioning of HVAC&R systems and related controls, lighting and daylighting controls, hot water systems, and renewable energy systems. Now, LEED v4 additionally requires commissioning for electrical service and distributions systems as well as plumbing systems. Secondly, projects over 20,000 square feet (as opposed to LEED 2009’s requirement of 50,000) require a third-party, certified commissioning authority who must be present before the completion of the design development process. LEED v4 also requires the commissioning authority to complete a design review as well as a plan that lists requirements for the operations and maintenance of the facility. A fourth amendment to the commissioning process encompasses the building envelope, as the commissioning authority must review the building envelope during the standard design review without exception. Finally, the point allocation increased for commissioning; LEED 2009 only allocated two points for commissioning; whereas LEED v4 offers a maximum of six points. A full study and analysis of LEED 2009, LEED v4, and the differences between the two is beyond the scope of this short Blog and could likely fill an entire book and/or fill a day long seminar. However, the USGBC move from LEED 2009 to LEED v4 is a big one which contains a wide range of amendments that affect all parties participating on a green project. These changes are not simply boilerplate or minor, and a failure to thoroughly review LEED v4 could cause a project to fail the new standards and not achieve certification. Therefore, project participants should consult sustainable construction experts before diving head first into the little known waters of LEED v4. Adrian D’Arcy has been a LEED accredited professional for nearly 10 years and frequently writes and lectures on the subjects of Green Building and Sustainable Construction.